Skilled and organised workers are now majority shareholders of companies across the world. Could we wield this power for socialist ends? 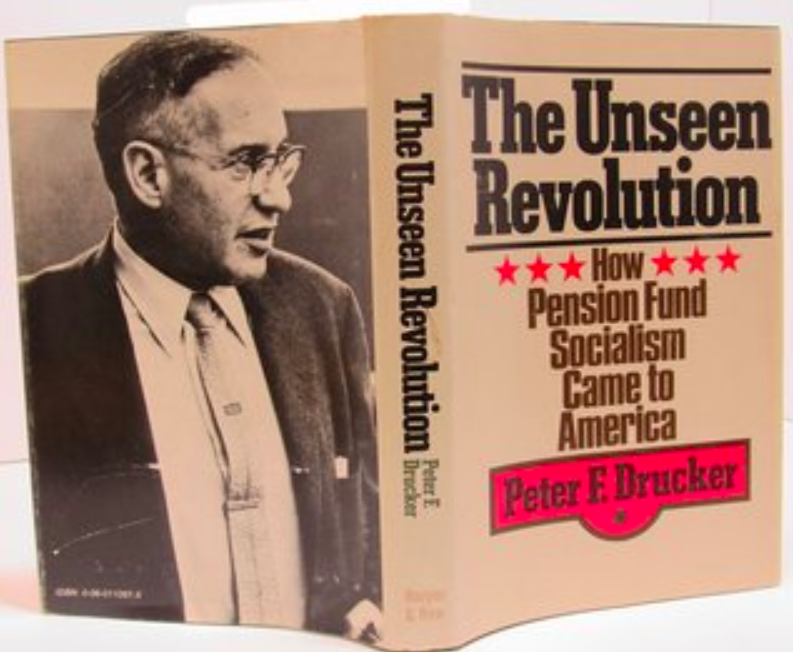 Peter Drucker's book The Unseen Revolution: How Pension Fund Socialism Came to America was published in 1976. There are 1.5 billion people around the world who now own a wide range of capital assets as a result of saving in pension funds. While most may be older, and some wealthier, these are fundamentally not powerful elites but working people saving for their retirement. Their pension savings form an ever-expanding chunk of global capital, and an untapped resource for extending worker power. In the UK, 30 million workers are saving into occupational pension pots, and several million drawing down their retirement savings. Similarly, in the US around 100 million people are enrolled in a pension scheme. Lower-income households participate in workplace retirement funds managed by public sector or union-sponsored schemes. A recent global pension fund study from Willis Towers Watson showed that these pension fund assets had grown from $26.58 trillion to $41.35 trillion in just the last decade. 2017 produced the largest growth in a single year of just over $4 trillion. Workers are now the majority shareowners of many public and private companies, with pensions invested in stocks and shares across the globe. The potential for these huge pools of capital assets to be used by workers to achieve socialist objectives was first fully recognised by the post-war management guru Peter Drucker in The Unseen Revolution: How Pension Fund Socialism Came to America , published in 1976. In the book he predicted that the proportion of global capital owned by workers would increase dramatically, and that this could shift our entire political economy. This was going too far, but Drucker was describing a stage of capital ownership which is increasingly emergent today, where the middle class and organised workers, through their pension funds, increasingly own the means of production. This form of ‘worker-ownership’ differs from Thatcher’s notions of individual private share-ownership by workers — a project unsuccessfully proposed in the US before the Second World War, and one that Drucker had already rejected. The difference lies firstly in the collectivisation of worker’s assets held in large pension funds, and secondly in their investment under a prudential regime governed by trust law. The latter means that savings are ‘socialised’ not only in practical terms, but also in the sense that all beneficiaries of such funds have an equal right in law to have their interests pursued, regardless of the level of their contributions. Clouding the categories of ‘worker’ and ‘capital owner’ will make many on the left uncomfortable. Drucker himself explored the paradoxical implications of ‘worker capital’ for the labour movement, noting that workers (albeit largely the organised and/or skilled) were becoming the dominant owners of listed capital, meaning that an increasing share of ‘surplus value’ was actually a transfer from ordinary employee to ordinary retiree. These blurred lines blur interests. If not thoughtfully considered as tools of wider organising strategies, the contradiction runs the risk of making workers’ struggles more complicated, and perhaps, more conflicted. But the fact is this very same capital — workers’ capital — is being used against us. In his recent book The Rise of the Working-Class Shareholder , David Webber, a law professor at Boston University, included numerous examples of workers’ capital being used against them in the US. This included a recent example when hedge funds investing teachers’ pensions ran campaigns for the privatisation of education. In the UK it is likely the same is the case: corporations driving down workers’ pay and conditions, polluting the environment, or paying obscene executive settlements will be, at least in part, owned by workers themselves, through their pension funds. The choice then is clear: either allow workers’ capital to continue to be used against us, or find ways to use it ourselves. The Labour leadership appears to grasp the importance of these issues. The shadow chancellor’s recent announcement that the next Labour government will give workers more say in the running of companies by offering them 10 per cent of share capital was an encouraging sign. But this has so far not extended to an explicit recognition that most publicly-quoted companies are already owned by workers, through their pension funds — and the potential power that this could offer the labour movement. Much more work needs to be done to allow workers to realise this potential. There are serious structural weaknesses in the UK pension system, which is fragmented and comprised of small funds. The retention of voting control over corporate behaviour by the external fund managers who invest workers’ savings is also a problem. The labour movement should start by organising the merger of smaller pension funds on an industry basis so that they hold around £100 billion in assets each. Pooling workers’ capital increases its strength and ensures our pension funds can exercise voting rights with the companies they invest in. These can then be used to further workers’ aims. Part of the problem is also cultural: pensions are not well understood, and their potential is even less so. The unions should play more of a role in supporting their members to use their pensions to create a better society. In UNISON I run a ‘Capital Stewardship’ programme that trains activists to engage with their pension funds on a wide range of issues such as climate change, labour standards, and executive pay. Alongside the pension funds of the TUC, Unite, GMB, UNISON, and the ITF we established Trade Union Share Owners which attempts to raise corporate governance issues at places like Sports Direct, Ryanair, and ASOS. We can never forget that, despite this accumulation of collective capital, pensioners themselves are not wealthy. The average annual retirement payment to the 4.5 million members of the Local Government Pension Scheme is around £3,500. These are not plutocrats growing fat on shareholder dividends, but millions of members of a growing population of worker-savers. Shareholder activism will only be successful if it keeps this in the forefront of its mind. Fundamentally the labour movement faces an urgent choice, to use the full range of tools at our disposal, or continue to allow our capital to be used against us. Workers saving through the workplace are owners of the labour and capital of all firms; we need to develop macroeconomic analysis and policy to ensure that we take full control of what we already own, and direct it towards building a better world. Colin Meech is National Officer at UNISON responsible for their Capital Stewardship Programme, he is also a member of the Local Government Pension Scheme Advisory Board’s Investment Committee representing 5 million scheme members.